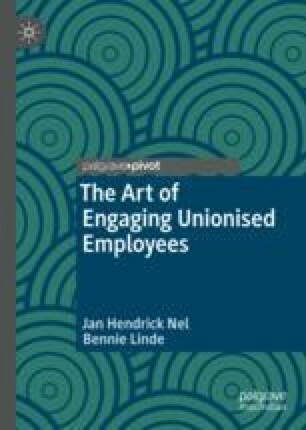 In order to address low levels of engagement in a unionised environment there must be a clear understanding of the circumstances that influence engagement levels in a unionised work environment. In this chapter, the dynamics of the employee-organisation relationship are discussed, in relation to the psychological contract and the employment relationship. The necessity for sound employment relationships and fulfilled psychological contracts are explained as a base for workplace engagement. It confirms that the employment relationship is also exposed to environmental influences, including the labour relations approach of a country with the resulting external labour regulations that need to be applied. The role of collective bargaining and the changed role of trade unions are placed in context with a globalised economic environment with the resulting demands on the employee-organisation relationship.